The best French toast is made from brioche, soaked in a nutmeg-flecked custard, then fried and put in the oven to puff up. I often make my own very quick syrup from fruit juice instead of drenching my French toast in maple syrup every time – I find that a simultaneously sweet and tart passion fruit syrup works best. I like to serve it with mango or, sometimes, sliced bananas. Beat the eggs with the milk and nutmeg in a wide bowl. Dip the brioche in, turning to soak both sides. Set aside. Scoop the passion fruit pulp into a small pan, add the vanilla pod, sugar and 50ml water and simmer gently for 10 minutes until syrupy. Preheat the oven to 190°C, gas mark 5. Place a frying pan over a medium heat and pour in 1 tbsp oil and half the butter. Allow to foam, then add 4 brioche slices. Cook for 1–2 minutes on each side until golden, then put them in the oven while you cook the remaining 4 slices in the remaining butter. Bake for 5 minutes until puffed and golden. Meanwhile remove the vanilla pod from the syrup. 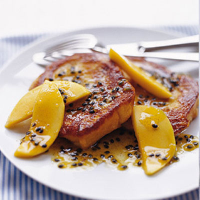 Divide the toast between 4 warmed plates, top with the mango slices and pour the passion fruit syrup over.